Hi guys! My online handle is karageko (well twitter is karagekon because karageko is taken) but my real name is Austin and I'm happy to be referred as either. This is gonna be pretty long so I hope you don't mind. I've known about this forum for about half a year or so I think (either through Anitwitter or Dawn's podcast blog). I'm a big fan of the AWO podcast and saw a bunch of names here I recognize from being mentioned on the podcast. So I thought about registering for some time but I put it off until after finishing up school. I first became an anime fan (i.e. being aware of the term anime and watching a lot of anime) around 2004, and then burned out around 2009. Around my burn-out period I found the Anime World Order podcast and that pretty much changed my life as an anime fan since then, and I've been paying a lot more attention to the actual individuals involved with creating anime since then, and especially anime from the 80s. That decade was seriously amazing for anime both in terms of the cel animation visual aesthetic and the broad coverage of genres. To name some of my favorites: Gunbuster, Legend of the Galactic Heroes, Super Dimensional Fortress Macross (TV), Macross Do You Remember Love, Robot Carnival. My heart is very much trapped in the 80s even though my body has never lived in it. I also like anime from the 70s as well: Galaxy Expres 999 TV (yes I watched every episode) and the Movie (still one of my favorite movies), Captain Harlock... and I'm trying to think of something that isn't adapted from Leiji Matsumoto material but nothing comes to mind at the moment. Pretty much all the anime fans I've ever met have zero interest in the actual background information of how anime is created and who creates them, and they especially don't care for anime from the 70s and 80s. So a lot of my interest in anime has been in relative isolation despite having been in the presence of a lot of anime fans; I'm kind of hoping joining this forum can connect me to people who actually share my interests more, because I feel very generationally displaced as far as the anime I focus on is concerned. Two months ago I also found out about the anime origin stories project. I wasn't sure if I should even bother submitting an entry since my story seems hardly relatable (especially for folks from my generation) but I thought it would be a good exercise and also be useful for introducing myself to this forum should my registration be accepted. Originally the plan was to wait for my entry to come out on the blog but the backlog is pretty big on that so I think what I will do is PM a staff member to edit my post to replace the text I wrote up for that with a link to the blog entry when/if it gets put up. I'd happily answer any questions people have about my story here. Not sure I'm all that interesting though. I find the old fandom stories a lot more interesting personally. For any folks who actually made it down here, I've included a few pieces from my cel collection. *cue dramatic music* Take it as a peace offering from a whippersnapper for the stuff in my story not related to old anime. Oh also I use IRC daily (seriously) so if there's some super duper top secret old anime IRC channel it'd be nice to know about. Welcome. The board is a little slow at times but I can verify that it is checked by the regulars here quite frequently as replies to new posts tend to come rather quickly. You got a cool story bro, I also submitted one for the blog about a month ago, haven't heard back yet, so I figured it's a matter of when at this point. I'll give you this piece of advice: don't feel bad from your introduction anime. People start somewhere, older fans have star blazers, speed racer and robotech, newer fans have Naruto, dbz and Attack on Titan. Your doing the right thing by exploring the medium of anime, and there is thousands of titles to pick from. The fact that your where your at shows your a mature fan, and your only gonna grow from there. I'm hoping anime origin emails me back with a following interview, because I would lI've to mention how big the initial d arcade scene played into my fandom, but we'll see. In terms of cel collecting, I got a handful ranging from victory gundam, hokuto no ken, riding bean and Sol Bianca that a member on this forum helped me get (thx akage!) Its one little side hobby of mine along with many others I enjoy. It's funny how you mentioned anime boston, since a couple of members on my podcast go every year and have done panels there as well, which we get some good con review material out of that. My fondest memory for my cohost and I were to troll the people complaining on the forums on how cold it was to stand outside in costumes laat year while we bragged how the weather was fine for us, at a con neither of us were present at. The short of it was were ip banned from the forums, so they won't get anymore trouble from us. We thought it was fun to do. But anyways welcome to the site, would love to hear what you gotta say. *We're actually not all bad, so your in a good place. As for me, that's a bag of worms right there. DKop wrote: I'll give you this piece of advice: don't feel bad from your introduction anime. Yeah I think the way I wrote about it came out a bit exaggerated; my shame if anything would be that I rewatched the mediocre filler of Naruto so many damn times haha. Without filler I've probably rewatched that show more than 5 times? Too much time and fervor as a beginning fan I guess. There's probably much worse things in my history of viewing to be "embarrassed" about but I've never felt bad enough about any of it to pretend I never watched some stuff. Honestly I find it strange how little other people's tastes seem to change with anime but maybe that's also more of a consequence of the short lifespan of the average anime fan; in that sense I guess those fans' tastes do change! DKop wrote: In terms of cel collecting, I got a handful ranging from victory gundam, hokuto no ken, riding bean and Sol Bianca that a member on this forum helped me get (thx akage!) Its one little side hobby of mine along with many others I enjoy. If there's one thing I feel bummed out about being a younger fan into 80s anime it's that I got into cel collecting at a pretty rough time. The first time I went to Nakano Broadway for cel shopping was about 3 years ago and I spent many hours across several days just pouring over cels. When I went back again 2 years ago there was a smallish cel shop I remembered that had a great collection which unfortunately closed up shop. 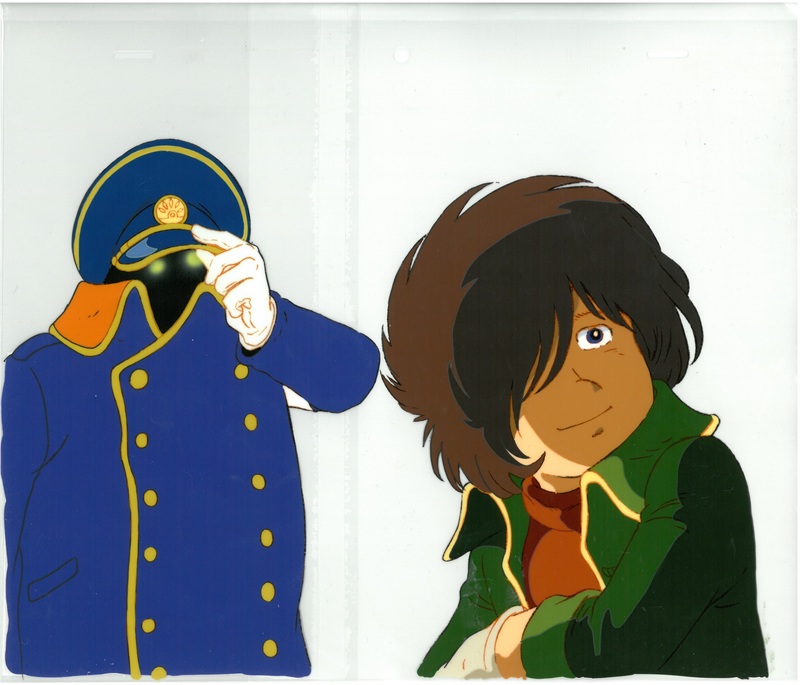 It had a very expensive and amazing looking Maetel cel from the GE999 movie! I kinda wish I talked to the guy running the store at the time but I'm a naturally introverted/shy person and bumbling over mediocre Japanese exacerbates the problem. I'm also jealous that you got a Riding Bean cel! Cool stuff. Maybe I should post my cel collection in a new thread (or revive an old thread if it exists that was already made for showing off cels). DKop wrote: My fondest memory for my cohost and I were to troll the people complaining on the forums on how cold it was to stand outside in costumes laat year while we bragged how the weather was fine for us, at a con neither of us were present at. The short of it was were ip banned from the forums, so they won't get anymore trouble from us. We thought it was fun to do. Bragging about not being cold is a hilarious reason to get IP banned from a forum hahahaha. Welcome, Karegeko! I'm always glad to see a 'current generation' fan buck the prevailing trend and dive into the wonders of the past! I think you need both the Crusher Joe and Space Adventure Cobra movies in your life. AWO is, in my opinion, the 'catalyst podcast' for real, serious (but not real serious) thought that can shift a fan from 'just watching stuff' into obsessing about all manner of things. Just keep an open mind, don't fear we fans of olde that tend to slip into bloviation on one thing or another, you'll have a lot of fun and may learn something new. Well here's the thing, it went from us bragging how the cold did bother us to us creating a far right extremist persona where we wanted to ban all cosplayers from AB and build a wall around the con and have cosplayers pay for it in order to "make anime boston great again," and throwing in notions of capital punishment to those who would go against the cosplay ban law. It's remarks like THAT is what got us banned, because my cohost and I wanted to see how far we could go. I have to give it to the AB forum mods, they didn't put up with our nonsense for very long. What got me and my co-host interested in doing what we did was we saw people replies of how they complained to a convention about how the weather was outside didn't "function" well with how they were dressed. It felt downright stupid that people want to accuse a convention of conditions the convention nor anyone in mankind ever could control, but it was somehow the cons fault. I think it was more boiled down to how the lines were formed outside, but what person doesn't think that a con wouldn't have any kind of lines at all? An idiot maybe? That is what prompted me to vent my feelings of their stupidity in my own unique way. SteveH wrote: Welcome, Karegeko! I'm always glad to see a 'current generation' fan buck the prevailing trend and dive into the wonders of the past! I have seen and own one of those film listed, meaning I still need to see the Crusher Joe movie. There is no excuse for that, and I tend to rectify my mistake very soon. karageko wrote: Yeah I think the way I wrote about it came out a bit exaggerated; my shame if anything would be that I rewatched the mediocre filler of Naruto so many damn times haha. Without filler I've probably rewatched that show more than 5 times? Too much time and fervor as a beginning fan I guess. There's probably much worse things in my history of viewing to be "embarrassed" about but I've never felt bad enough about any of it to pretend I never watched some stuff. Honestly I find it strange how little other people's tastes seem to change with anime but maybe that's also more of a consequence of the short lifespan of the average anime fan; in that sense I guess those fans' tastes do change! There is some sort of idea going on about people crapping all over Initial D, and I will proudly be one of those white knight defenders for that series so long as I draw breath. As long as you can at least see the errors of a series, but still have a soft spot for the series that still gives you nostalgia of "I wouldn't be a fan if it wasn't for (that series)" then there is no shame in still stating that series is special to you. We all started watching anime from somewhere, and its important to not be ashamed of your roots. As long as you grew as a fan to discover other things your doing fine. My first cel was the Riding Bean one I do have, and I got that from a dealer who has been going to cons probably since the 90's called Asylum Anime. Its an older gentlemen who's from the midwest named Kurt, and I've been able to develop a good relationship over the years seeing him at Animazement. His front has some good stuff, and you can sometimes get somethings at decent prices (while other things he over charges on IMO but hes gotta make a living). Kurt been the person ive gone too over the years to get stuff from since hes the only seller I know that does handle with animation cels. He's had things from scenes from Cowboy Bebop film and Evangelion hanging up in his booths that I never thought I would hold in my hands. With cel's your holding a literal piece of art that animation studios considered to be "junk" once the cel has been shot and put into production. Cel animation is going to be noted in art history as collectible items in the future, so its always good to hold on to what you got from the way I see it. 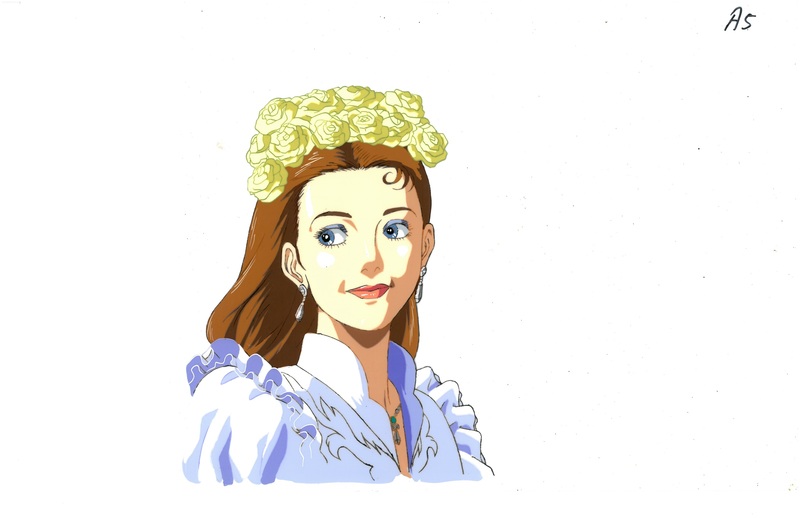 Im gonna take a stab at the first cel with the woman: Is it from LOGH? I wanna saw Robot Carnival but I don't remember someone like her showing up in it, but based on the level of detail, it could come from either show. SteveH wrote: I think you need both the Crusher Joe and Space Adventure Cobra movies in your life. I've watched all the animated Cobra that exists and enjoyed it very much, especially the movie. Honestly, the Dezaki + Sugino combo alone is enough to sell me on trying something out (I'm in the middle of Aim for the Ace right now actually haha). Crusher Joe is on my to-watch list! I actually started the movie briefly and then paused it a few years ago for some reason I can't remember and just never got back to it. I'm pretty sure it had nothing to do with disliking it though. DKop wrote: What got me and my co-host interested in doing what we did was we saw people replies of how they complained to a convention about how the weather was outside didn't "function" well with how they were dressed. It felt downright stupid that people want to accuse a convention of conditions the convention nor anyone in mankind ever could control, but it was somehow the cons fault. I think it was more boiled down to how the lines were formed outside, but what person doesn't think that a con wouldn't have any kind of lines at all? An idiot maybe? That is what prompted me to vent my feelings of their stupidity in my own unique way. I totally get the idea of messing with people for things like that . Although sometimes I run into the problem of people not realizing when I'm joking or not. I've never particularly been interested in cosplay culture ever and I kinda go "eh" whenever I see or hear about cosplay at an anime convention that isn't even remotely related to anything Japanese. As long as it doesn't interfere with my activities then it's no concern of mine one way or the other. I'm very much live and let live these days. I talked to Kurt a bunch at Anime Boston 2017! His table was easily the highlight of the dealer's room for me at both AB 2016 and 2017. I found it kinda funny because he could tell what sort of fan I was based on the cels I was looking at (BGC, LOGH, Riding Bean, GE999, etc.) 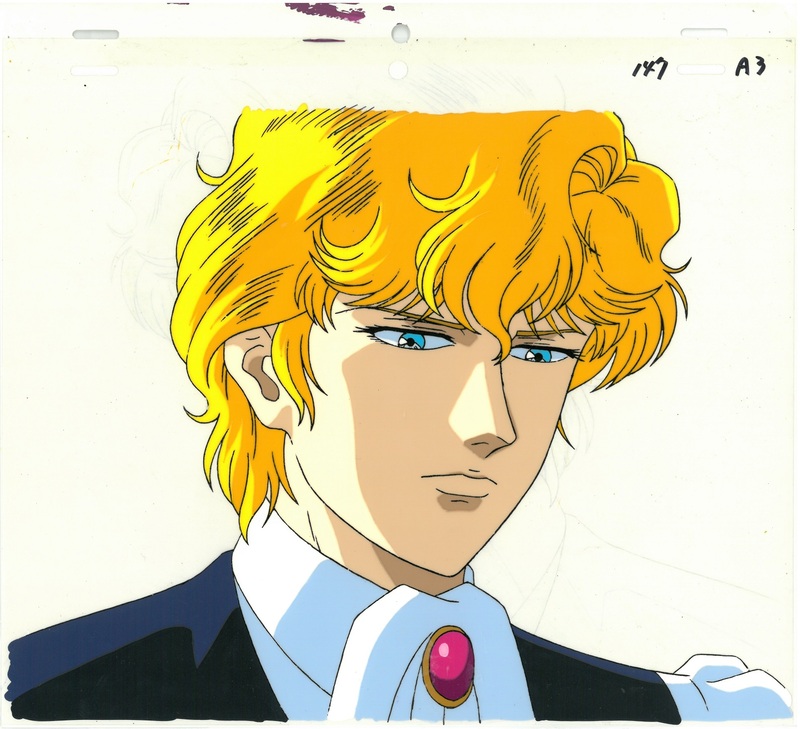 but most everyone else (young folk) that came by who looked at the cels that went "Oh whoa this place has cels!" he'd immediately say something along the lines of "You can find the Spike Spiegel cels in this binder if you're interested" . Kurt also let me take a look at his cels that he had in oversized binders that wouldn't fit easily on the dealer's room tables. I've only bought posters from Anime Asylum both years I went to AB but next time I see him I'll make the jump and actually buy the cel. For some reason buying cels in US dollars is more intimidating to me than when I am buying them with Japanese yen . 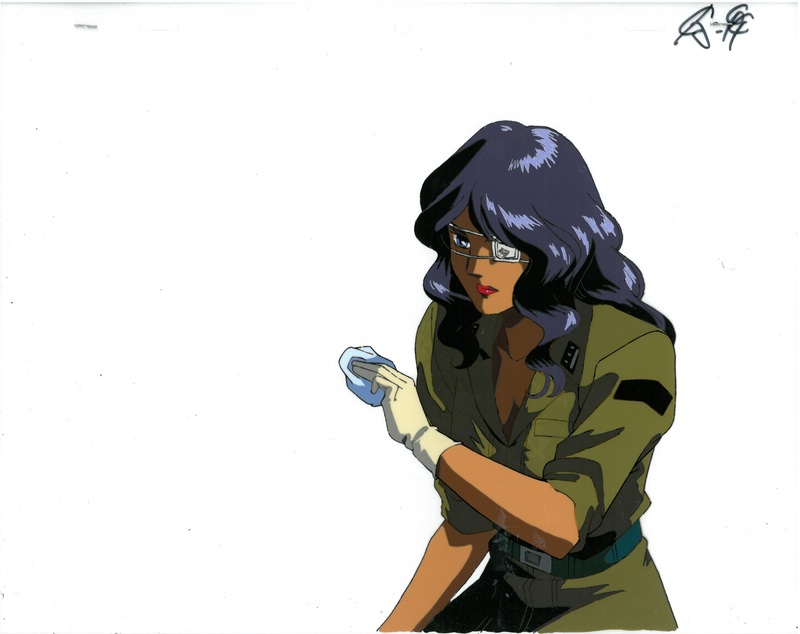 DKop wrote: Im gonna take a stab at the first cel with the woman: Is it from LOGH? I wanna saw Robot Carnival but I don't remember someone like her showing up in it, but based on the level of detail, it could come from either show. Yea man, Kurt a cool dude, he seems like a hippie but hes super cool to talk too. I've had some really good convos with him in the past, and the most recent video I can find him in is some footage of an A Kon dealers room in 2000 selling stuff, so hes been around for god knows how long. I remember him telling me how he went to school for business and didn't think he wound up selling stuff at anime cons for the rest of his life, but hes like "oh well, thats how it goes I guess" then kinda laughs about it. He wasn't at AZ this year, it was some other guy which I think ive meet him one a couple of years ago and he doesn't look all that "friendly" to me. The last poster I bought from Kurt was my BGC Revenge Road that hangs above my computer at the moment. Its one of my favorite BGC episodes so of course i'd spend whatever to get it. He was cool taking off like 10 bucks for me when I got it.